Children around the world dream about what Santa Claus will leave under their decorated trees on Christmas morning. Administrators of the Center for Family Justice hope their Christmas gift will be a successful 34th annual Fairfield Christmas Tree Festival at the Burr Homestead, 739 Old Post Road, because the agency is this year's beneficiary of the holiday fundraiser. "It's part of the history of the town, it's a long-standing tradition. People look forward to it each year," said Donna Craft, one of the three event chairwomen. The popular and festive event opened to the public Friday and continues through Sunday at the historic mansion. The festival's overall theme is "Cherishing Family, the Greatest Gift of All," said Catherine Gallagher, one of the tri-chairwomen and board member for the Center for Family Justice. Hundreds of people visited the homestead Friday to enjoy the festival's designer-decorated rooms, custom-created live wreaths, Santa's Room -- where Santa posed for photos and listening to children's Christmas wishes -- a holiday boutique, and decorated trees and wreaths for sale. Tall, stuffed teddy bears held a tea party in the center of the living room. A room on the second floor paid tribute to the town's nautical history with sequined sea stars, driftwood wreaths and mermaid ornaments. In the dining room, volunteers served hot mulled apple cider. "I love the colors, and the atmosphere itself puts you in such a Christmas spirit. It's really beautiful, and it's nice to be in a place where you don't have to think about anything other than the spirit of the holiday," said Kathy Allen of Fairfield. Since its inception in 1981, the Fairfield Christmas Tree Festival has raised more than $3.7 million for local charitable organizations. Proceeds, which could top last year's fund-raising efforts of more than $260,000, will go toward opening the first Family Justice Center in Connecticut. There are 95 such facilities throughout the nation. Connecticut's will open in Bridgeport next October and will provide comprehensive services under one roof to victims of domestic violence and sexual abuse, said Debra Greenwood, president and CEO of the Center for Family Justice. Services are free and confidential, and include legal services, counseling, community-based advocates and access to police support, Greenwood said. All services are offered to residents of Fairfield, Bridgeport, Easton, Monroe, Stratford and Trumbull. "The Christmas Tree Festival is actually making a dream come true. We've been working on this (new center) for five years," she said. Renovations to the Bridgeport center will begin in January. More than 200 volunteers help during the three-day Christmas Tree Festival, and that doesn't include members of the decorating teams who have worked for months. Some volunteers have participated for years, even decades, like Pennie Kelly of Easton and Nancy Henry of Fairfield, who made custom wreaths Friday. Vicki Yurkerwich of Fairfield returned as a volunteer several years ago after an absence of about 15 years. 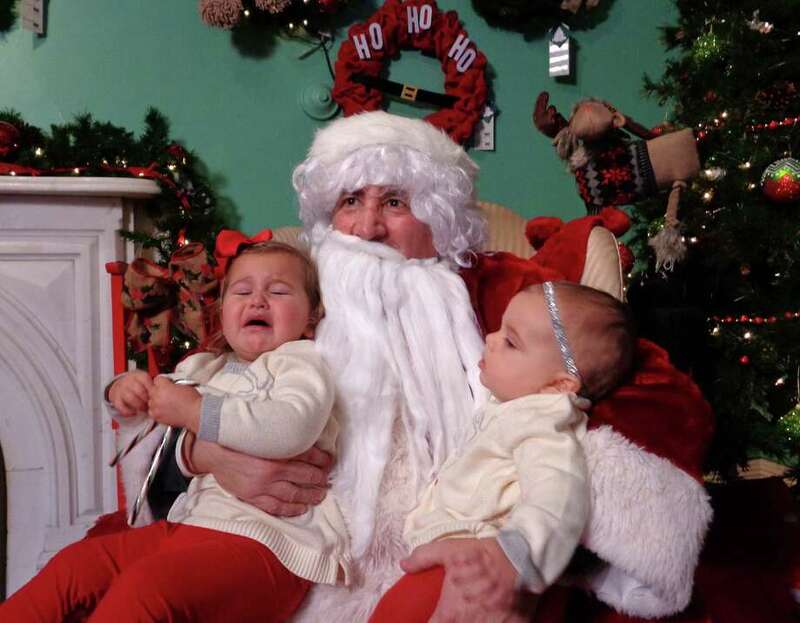 "I decorated the Santa Room 27 years ago when my son was 3." And she chaired the event two years ago. The Fairfield Christmas Tree Festival general admission continues Saturday from 10 a.m. to 7 p.m. and Sunday from 10 a.m. to 4 p.m.
Special events include: Christmas Around the World on Saturday, 7-10 p.m., is $75 per person and features food and music from other countries; Holiday Tea on Sunday, noon-2 p.m., is $50 per person and feature high tea with Victorian gingerbread, scones and tea sandwiches. General admission is $10 adults, $5 children and seniors. Purchase tickets to the special events at www.FairfieldChristmasTreeFestival.org.